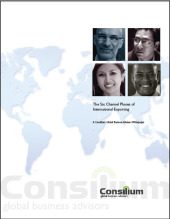 Whitepaper - free download "6 Keys to Selecting the Right Export Advisor"
Exporting and international business development feel complicated. They don't need to be, but there's a right way and a wrong way. Getting advice often makes sense - but what kind of a firm and what qualifications do they need? There are lots of models and lots of choices. What services should you insist on? Is an advisor right for your situation? Maybe the chamber of commerce 'stale bagel' checklist seminar is all you need....but if you think you want more, download the whitepaper to understand your options.